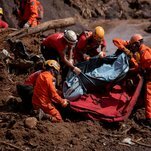 Vale faces mounting anger and public pressure as the death toll rises and rescue workers acknowledge that efforts to dig through the sludge are focused more on finding bodies. The company also jointly owned another upstream dam 75 miles away, near the town of Mariana, that burst three years ago, killing 19 people and unleashing one of the worst environmental disasters in Brazilian history. In Brumadinho, about 100 people gathered in the local cemetery on Tuesday morning to mourn the death of Duane Moreira, 33, who was operating a train in the mining compound when the dam broke. His wife, two sisters and mother wept over his closed coffin. Juarez Oliveira, a local priest, called Mr. Moreira’s death a murder. Luciano Siani, the chief financial officer of Vale, announced that the company would give the families of those killed 100,000 reais each, or around $ 26,800. Judges have ordered the company to set aside 11 billion reais, about $ 2.9 billion, to pay damages caused by the dam collapse. The announcements have done little to console residents of Brumadinho. Mr. Moreira’s mother, Rosângela de Mattos, is not only mourning her son but is also unsure of the fate of her sister, who was working at the mining complex on Friday. She has not been heard from since the dam collapsed.